Liberal Grace: GOP blocks up or down vote! I thought they were fans! GOP blocks up or down vote! I thought they were fans! What happened? Conservatives used to be huge fans of the "up or down vote"! 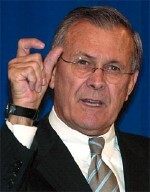 WASHINGTON - A move by opposition Senate Democrats to force a vote on whether Defense Secretary Donald Rumsfeld should stay on the job is likely to fizzle Wednesday. Republicans promise to block a vote on the measure, which they called a political stunt. Here is a 2005 National Review op-piece very enthusiastic about "up or down votes" called "Up or Down." I wonder of the National Review is going to do an op-ed criticizing the GOP leadership from blocking this "up or down vote" of no confidence on Rumsfeld?